This four bedroom home has a living room with electric fireplace, TV/VCR/DVD, high speed internet, fully equipped kitchen and central A/C. There are 3 full baths including one off the master bedroom with whirlpool tub and gas fireplace. The remodeled lower level has one bedroom, a family room featuring a foosball table and wet bar. Relax on the deck or enjoy your grilling pleasures. This home is located at Springbrook Resort 2.5 miles off the main strip in Wisconsin Dells. 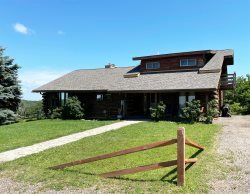 The amenities include indoor pool, 2 outdoor pools, workout room, game room, 7 acre fishing lake (need WI fishing license) with paddle boats, row boats and canoes available for rent, miles of walking nature trails, bar and grill, 9 hole golf course, cross county ski trail and county snow mobile trails. Very friendly and responsive. Gave us a free upgrade to a larger, more suitable house. Wonderful location, lots of room for all of us, plenty of bathroom space but grill could have been bigger and kitchen could have been better stocked cooking utensilwise. People who greeted us were friendly and helpful. all members we encountered were awesome!! again the group at Sand County where we pick up our keys were the BEST!!! Your property exceeded our expectations and we loved it!! The only thing we would suggest is a larger grill!! Otherwise it was perfect! We stopped in the office twice and the staff was very friendly and helpful both times. This is the third time we've stayed at this property, it meets our needs very well. We absolutely have never had a bad experience in the 12+ years we have been coming they always have extra's that make each so nice we all look so forward to each visit. Your staff was friendly and knowledgeable. The house was amazing. the only downfall was a broken grill lid, but other than that the house was in excellent shape, clean and spacious. The ladies in the Realty office were very accommodating and had a very Happy attitude! They recommended the Tommy Bartlett show and we are glad they did! It was an excellent end to our week in the Dells! Sunny Retreat was a great place to stay! A little cold downstairs but finally got the space heaters to work. Our family enjoyed being together under one roof and the large kitchen table accommodated eating & playing games for our family of 9. The pools & golf course were wonderful! We will not hesitate to return again in the future!